Alistair Spalding has been Artistic Director and Chief Executive of Sadler’s Wells since 2004. Under his tenure, Sadler’s Wells has become a world-leading dance house that offers an ambitious programme of dance in all its forms and presents first-class UK and international artists and companies. The theatre welcomes audiences of over 500,000 in London and attracts touring audiences of over 130,000 each year. In 2005, Alistair announced that Sadler’s Wells was to become a producing house. He has since driven the commissioning, producing and co-producing of more than 170 shows, including acclaimed cross-art form collaborations Sutra and m¡longa, and William Forsythe’s A Quiet Evening of Dance. He also created the position of Associate Artist to the theatre. Today, Sadler’s Wells supports 16 Associate Artists, three Resident Companies – Company Wayne McGregor, New Adventures and ZooNation: The Kate Prince Company – one Associate Company, English National Ballet, and three International Associate Companies: Acosta Danza, Anne Teresa De Keersmaeker’s Rosas and Tanztheater Wuppertal Pina Bausch. These artists and companies represent the most exciting talent working in dance today. Alistair’s first job in arts management was at the Hawth Theatre, Crawley, where he was a programmer in 1988-94. Between 1994 and 2000, he was Head of Dance and Performance at the Southbank Centre in London. 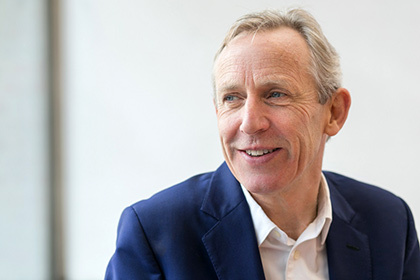 He has been responsible for the artistic programme at Sadler’s Wells since February 2000, when he joined as Director of Programming, before becoming Artistic Director and Chief Executive in October 2004. Alistair holds honorary doctorates from Middlesex University (2012), the University of Hertfordshire (2014) and the University of Roehampton (2015). He was a national member of the Arts Council England Council from 2009 to 2017, and a member of the Arts Council England Dance Advisory Panel in 1995-2003. He was awarded the Chevalier des Arts et des Lettres in 2005 and was appointed a Commander of the Order of the British Empire (CBE) in the Queen's Birthday Honours 2012, for services to dance. In January 2019, he was honoured with a lifetime achievement award by ISPA (International Society for the Performing Arts) in recognition of “unique lifetime achievement that has enriched the international performing arts”.